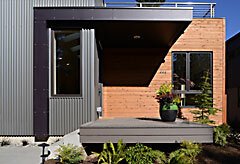 Davis Studio A+D / pieceHomes has recently designed this modern Bainbridge Island retreat. The expansive windows on this single family residence bring in sweeping views of the Northwest including beautiful Manitou Beach and Mt Rainier beyond. 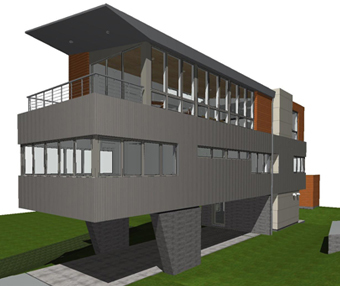 We are finalizing the design and pursuing modular construction methodologies to save time in construction while also having less on-site construction impact. 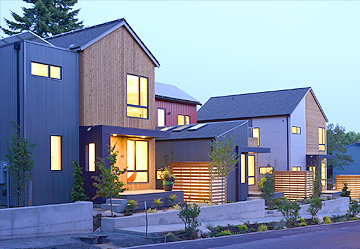 Davis Studio A+D / pieceHomes is the Architect for Grow Community (Phase One) on Bainbridge Island which is just a short ferry ride from Seattle. Led by Architect Jonathan Davis, Grow Community is the first residential One Planet Community to be built in North America. 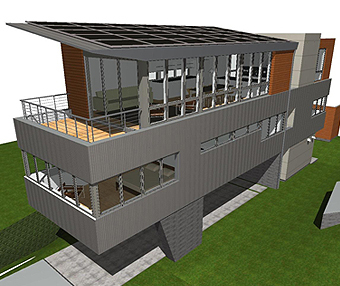 This zero net energy community, located on eight acres adjacent to the urban core of Winslow, includes 135 units, and a central community building. These modern homes sold out quickly as they are warm and welcoming using interior finishes that have been selected for both their sustainable qualities and also to create inviting, comfortable living spaces. The Grow Community on Grow Ave, Bainbridge Island. Grow Community has been endorsed as the first residential One Planet Community to be built in the US. All homes are extremely energy efficient with on-site photo voltaic solar panels. In fact, the community has been designed to be zero carbon by 2020. The on-site photo-voltaic solar panel arrays generate enough energy to off-set that used by most of the residences thereby greatly reducing monthly energy costs and more importantly their carbon footprint. 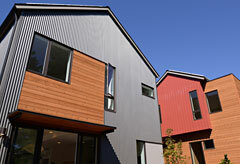 These homes were pre-fabricated in an off-site factory as panels and then trucked to the site where they were assembled in the course of a week. On-site finish work was completed once the shell was assembled. Phase One houses and apartments are now fully occupied and the community spirit continues to grow. 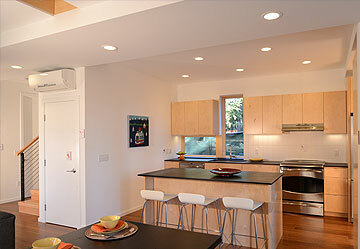 The light filled kitchen of the Everett home. Like us on Facebook to keep posted on the most current news. 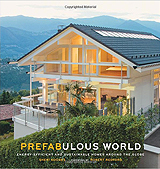 We're pleased to have been included in Sheri Koones' most recent book "Prefabulous World" - the latest in her Prefabulous series. Check out the section on Grow Community. The hardcover book available in stores and online. Grow Community Phase One Complete! More videos of our pieceHomes installations on youtube.com. 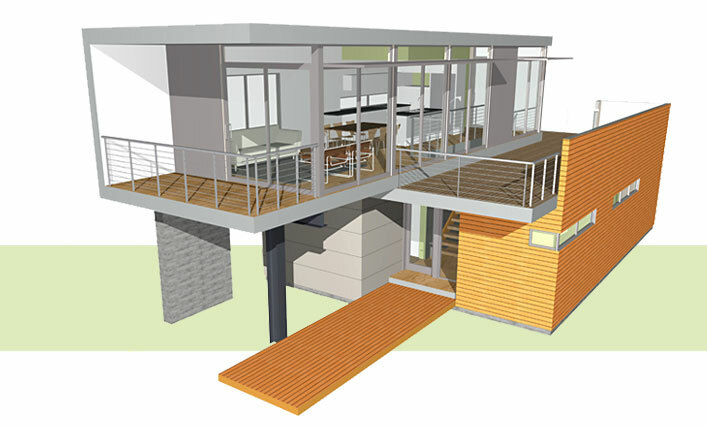 pieceHomes® is a line of green, modular and pre-fab houses designed by the architects at Davis Studio Architecture + Design. 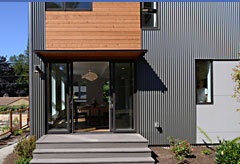 pieceHomes balance beautiful modern designs with green features and energy efficiency. Balancing your desires with the needs of the environment creates a healthier home. We have a line of pre-designed homes, we work with individual clients to design custom projects, and we work with developers to create sustainable communities. In your email, please include: your contact information, the intended location (city/state) for your pieceHome, and any specific questions you might have.